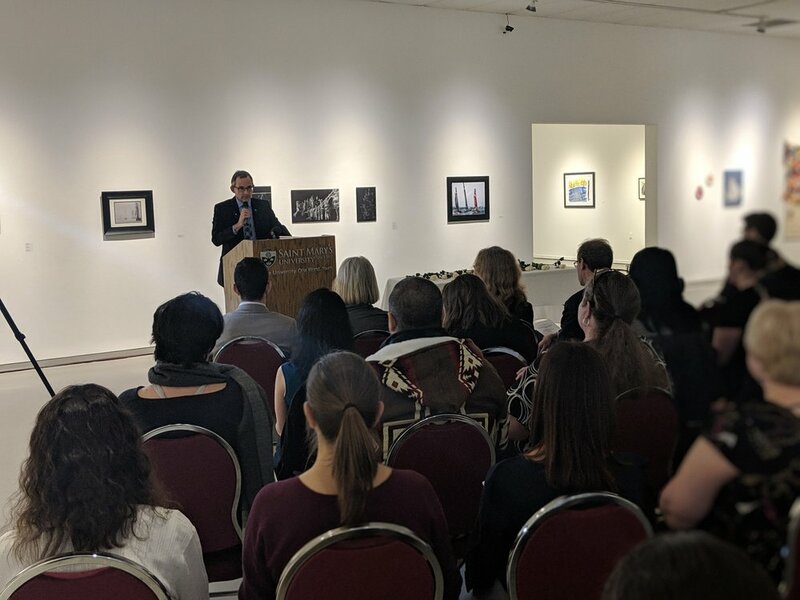 Close to 75 faculty, staff and students gathered to observe the National Day of Remembrance and Action on Violence against Women on Thursday, December 6 in the Art Gallery. Presented by Saint Mary’s University and Peaceful Schools International, the solemn day marked the 29th anniversary of the shooting deaths of 14 female students at École Polytechnique in Montreal. Saint Mary’s has been holding the memorial annually since 1989, when the tragic shooting occurred. In his remarks, President Robert Summerby-Murray reminded attendees that universities are to be both places of “sanctuary” and action to create a culture of respect for all, and that universities must lead in this action. The service included a poem reading by Lindsay Vandewater, SMUSA Equity Officer as well as a moment of silence in honour of the fallen women. Brianna Comeau and Kartik Saini of the SMU Women’s Centre presented the “Solidarity Canvas” hanging in the Art Gallery, a student-created, interactive installment that acknowledges violence suffered by women and other marginalized communities, and urged people to listen, believe, speak out, intervene and act to become allies. Members of the SMUSA executive, the SMU football team and the Conflict Resolution Society gathered at the front of the room to quietly place 14 white roses in a vase as the names of the shooting victims were read aloud. Danielle Day, 3rd year Engineering student at SMU, was awarded the Montreal Women’s Memorial Scholarship. Grade 8 students and creators of a trio of children’s books on peaceful conflict resolution were invited to the podium and attended and spoke of their hope and optimism that in the future, women would not longer have to face such violence. Pictured L-R: Patrick Guerra, SMU’s student coordinator for Peaceful Schools International; Ruby Jangaard, Amelia Penney-Crocker and Marin DeWolfe, who created new books for Peaceful Schools International; Bridget Brownlow, SMU's Conflict Resolution Advisor, President Peaceful Schools International; Michaela Peters, a SMU Arts student who has travelled with the SMU Northern Ireland Peace Education Program. YMCA of Greater Halifax/Dartmouth has awarded its 2018 Peace Medal to Bridget Brownlow, Conflict Resolution Advisor at Saint Mary’s and President of Peaceful Schools International. 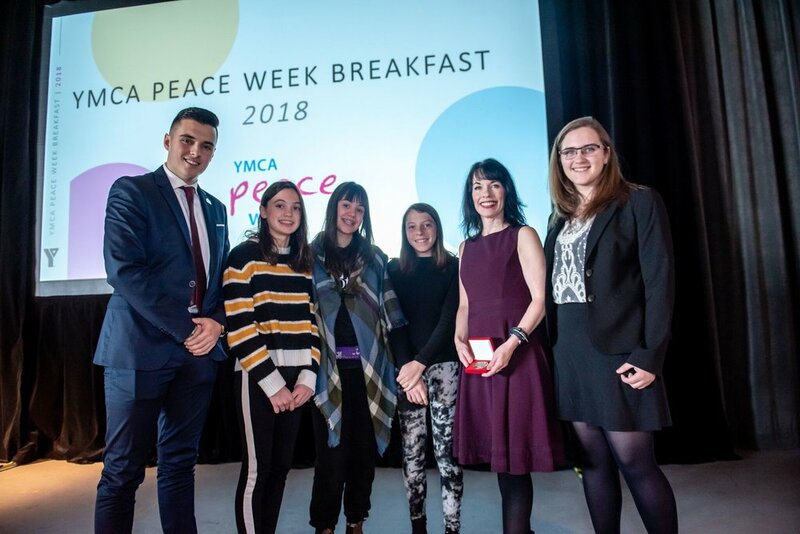 YMCAs across Canada present the Peace Medal to individuals or groups who, without any special resources, status, wealth or position, demonstrate a commitment to peace leadership within their local, national or global community. Representatives from Saint Mary’s University recently participated in a conference on peace in Northern Ireland. The conference, “Twenty Years of Peace: Progress and Possibilities in Northern Ireland,” took place at Yale University on November 29 and 30. The symposium brought together academics, community leaders, politicians and architects of the Belfast/Good Friday Agreement, which in 1998 marked a formal end to the conflict in Northern Ireland. 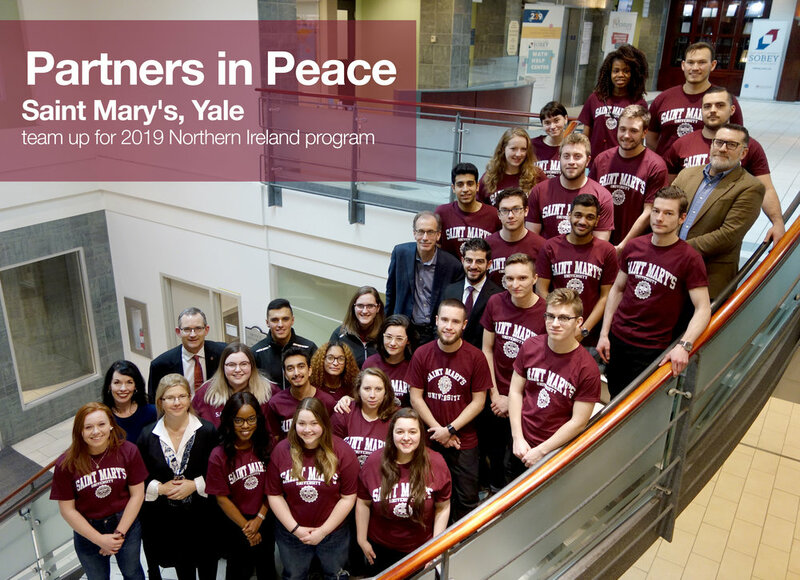 “Our Northern Ireland Peace Education Program has existed for 14 of the past 20 years since the Good Friday Agreement,” notes Bridget Brownlow, SMU’s Conflict Resolution Advisor and President of Peaceful Schools International. She and Dr. Robert Summerby-Murray, President and Vice-Chancellor of Saint Mary’s, attended as invited discussants at the symposium on Yale’s campus in New Haven, Connecticut. Dr. Summerby-Murray’s academic research and teaching interests include cultural and historical geography in Northern Ireland; and he has been a strong champion for SMU’s collaboration with Peaceful Schools International, as well as experiential learning and global engagement. Brownlow, who recently received the 2018 Peace Medal from the YMCA of Greater Halifax/Dartmouth in November, was also part of a public panel session. Her session at the Yale event , “The Future(s) of Northern Ireland,” was chaired by Dr. Richard N. Hasse, an American diplomat long involved in efforts toward Northern Ireland’s peace process. Participants included Simon Coveney, Tánaiste (deputy head) of the government of Ireland; Karen Bradley, British MP and Secretary of State for Northern Ireland; General John de Chastelain, a member of the International Advisory Board for Peaceful Schools International; and others. “My role was to speak to the unique and progressive nature of our peace education programming, whereby we are sharing the same peace education resources locally as we are with children in Northern Ireland,” says Brownlow. Saint Mary’s is also keen to continue a working relationship with researchers at Yale in relation to peace education. Brownlow and Dr. Bonnie Weir, a political science professor at Yale, are looking at ways for the two universities to collaborate. Last month, with support from SMU and SMUSA, Peaceful Schools International launched three new storybooks written and illustrated by three Halifax junior high students. The resource books will be distributed to elementary schools in Nova Scotia and during the next SMU visit to Northern Ireland in February.